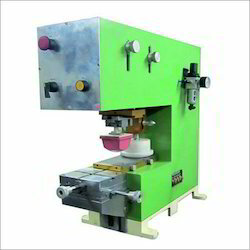 Table Top Electro Mechanical Coder manufactured by our company is reputed in the domain of manufacturing, supplying and exporting of Online Non Contact Ink Jet Printer which is ideally suited for the purpose of semi automatic coding. Available in two models- EMC-35 and EMC-100, these use ink paste as their inking medium. In addition to this, these have marvelous construction are based on the DC stepper motors. Finally, these are quite easy to maintain and install. 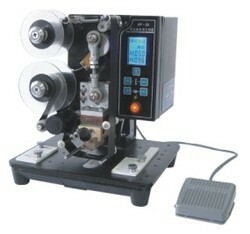 Table Top Electro Mechanical Coder is a low cost machine with very low operating and inventory costs. Uses standard grooved or flat stereos and fast drying coding ink. Our company is very well appreciated in the domain of manufacturing, supplying and exporting of Table Top Electro Pneumatic Coder which has outstanding capacity and precise functionality. These coders are extensively used to code intermittent packaging machines and retaining their salient information. In order to perform timed operation, these are attached to sensors, switches etc. Finally, these coders are available in tow models EPC-34-T and EPC-100-T.
Printing Speed Max. 150 imprints / min. Table Top Electro-Mechanical (motorized) Coder Model EMC – 100 – T with Digital display, soft touch keys & production counter, for semi-automatic registered printing of B.No., Mfg.Dt., Exp.Dt., M.R.P. `, etc. The stereos used are flat or grooved type which can be easily press fitted & replaced daily for a max. 6 to 10 line printing area of 50 X 100 mm. It has in-built settable timer for speed control & also has Foot Switch for controlled operation to give production speeds from 1000 to 2500 pieces per hour depending upon operator skill. (Free accessories include 1 Lit. Ink, 1 Lit. Solvent, 4 mm Grooved Rubber Character Set, Ink Cartridge & Foot Switch). 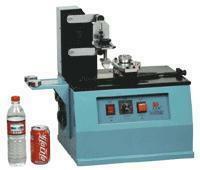 This coder is multi-purpose & suitable for registered printing on pouches, labels, laminated cartons, tins, bottles, etc. We are profound supplier of Table Top Electro Pneumatic Coder, which can be connected to any sensor, limit switch, etc. 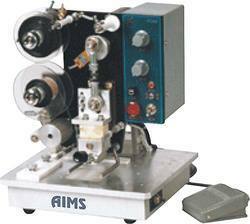 for online controlled operation or to timer for automatic timed operation Imported pneumatic accessories provide reliability, long life and speeds upto 150 impressions per minute. Printing Speed Max. 100 imprints / min. 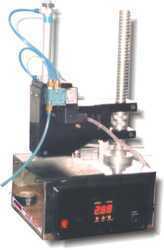 Table Top Hot Foil Coder that we provide to our clients are ideal for Semi-Automatic Coding. As soon as the product is put on the platform, coding is done automatically. The 3-line message to be printed is easily composed by pushing the Brass Stereos into the grooves & tightening them. The inking is in the form of Foil ribbon, which passes below the stereos & is advanced automatically after each print. The brass stereos are heated to a temperature of around 150 deg. C & hit the film onto the substrate thus transferring the print with embossing. These are portable, compact and easy to install units. Simply plug the system into any electrical outlet of 230 VAC at your site to start printing. Printing Speed Max. 60 prints / min. 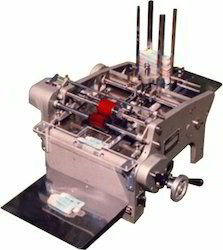 Stacking Hot Wax Table Top Coder is ideal for Automatic High Speed Coding on large quantities of labels & cartons. It delivers high quality multi-line printing at production speeds upto 300 impressions or pieces / minute. The message (upto 6 lines) to be printed is very easily composed by just assembling the brass / copper stereos (easily changeable) by pushing them onto the rods on the print drum and locking them into place. 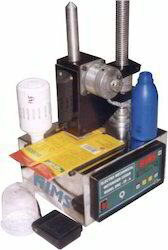 The Inking system consists of a replaceable circular hot wax cartridge, which is suitable for porous and non-porous surfaces. The stereos & the ink cartridge are heated to a temperature of around 150 deg. C & this heated ink is used for printing on the substrate, so it is instant drying. The labels / cartons are stacked or fed individually in the input tray for feeding, automatically picked up one by one by the reverse roller, passed under the print head & stacked in the collection tray at very high speeds. The location of printing is electronically settable by trim-pots so that the printing is done exactly at the same location every time. Also a preset counter is present where you can set your production batch & the coder stops automatically when the desired production is over. Printing Speed Max. 300 imprints / min. using stepping clutch. The Motorized Pad Printing Machine that we provide to our clients is a combination of offset & gravure printing process. Plate system is like gravure & printing system is like offset. 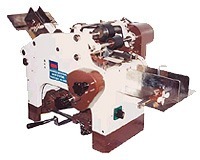 In gravure printing, design is etched on a roller whereas in pad printing, flat plate carries an image. A rubber blanket, in offset process, picks up image from the plate & transfers it on the substrate. Similarly a solid mass of rubber called pad, picks up ink from the etched plate & prints on the substrate hence the process is known as pad printing. Because the pads are very soft, they are able to take the shape of the product & so pad printing is possible on irregular surfaces, uneven surfaces & flat surfaces with the same ease & clarity. Today, pad printing is used successfully both in the field of high quality decoration and in the field of labeling and marking. Due to the versatile use and the development of this technology, it has gained great importance and developed into a universally recognized printing process. 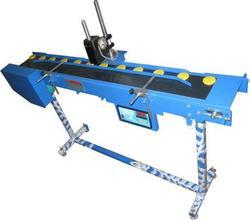 Motorized Pad Printing Machine is used for pad printing. It is an indirect method of printing, a combination of offset & gravure printing process. Plate system is like gravure & printing system is like offset. In gravure printing, design is etched on a roller whereas in pad printing, flat plate carries an image. A rubber blanket, in offset process, picks up image from the plate & transfers it on the substrate. Similarly a solid mass of rubber called pad, picks up ink from the etched plate & prints on the substrate hence the process is known as pad printing. Theory of pad printing: The ink is spread over the plate to fill up the image on it. Doctor blade or ink cup cleans the plate leaving ink in the etched portion only. The upper surface of the ink film is exposed to air. The silicone rubber pad comes down & presses on the image area on the plate & goes up with the ink film on it. The pad now moves over to the object to be printed & again moves down onto the object to transfer the print image onto the object. The Flat Printing Machine that we provide to our clients is a combination of offset & gravure printing process. Plate system is like gravure & printing system is like offset. In gravure printing, design is etched on a roller whereas in pad printing, flat plate carries an image. A rubber blanket, in offset process, picks up image from the plate & transfers it on the substrate. Similarly a solid mass of rubber called pad, picks up ink from the etched plate & prints on the substrate hence the process is known as pad printing. 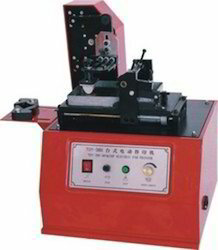 We provide our clients Foil Stamping Machine . These coders are ideal for Semi-Automatic Coding. As soon as the product is put on the platform, coding is done automatically. The 3-line message to be printed is easily composed by pushing the Brass Stereos into the grooves & tightening them. The inking is in the form of Foil ribbon, which passes below the stereos & is advanced automatically after each print. The brass stereos are heated to a temperature of around 150 deg. C & hit the film onto the substrate thus transferring the print with embossing. Looking for Off Line Coding Machines ?